Make sure that your contact lists are up-to-date and synchronized by using our DOI Contact Import to automatically send your customers a confirmation email. This email contains a link that recipients need to click before they are activated. Contacts who do not click on this link remain deactivated. 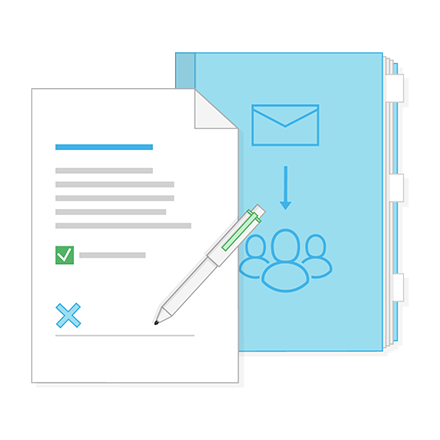 Because most jurisdictions require a written confirmation that recipients want to receive your newsletter, the Double Opt-In procedure ensures legal compliance. This is particularly important when you import customer databases that contain individuals who have not explicitly agreed to receive a newsletter. Once you import data into the newsletter software, the contacts are automatically listed as “inactive.“ A Double Opt-In Email will then be send to every recipient. Not only will you stay legally compliant, you will ensure that only the right people will receive your newsletters. Clicking on the link counts as written confirmation, and the recipient will be reclassified as “active” and will immediately be eligible to receive your newsletter! The DOI Contact Import feature also allows you to design your own confirmation email. This lets you control the newsletter experience from the very beginning. You can import data in numerous formats, including .xlx, .xlsx, .csv and .ods. How do I install the Joomla Newsletter Plug-in?